Happy Friday! I'm teaming up with my girls, Narci and Andrea, to bring you our Friday Favorites! I have a hot mess of random favorites for you today. Last Friday was the 100th day of school for the big kids. The first graders (Ebby Lee) had to wear something with 100 somethings. She wanted so badly to wear a shirt with a bunch of pom poms, so that's just what we did. We might have over counted and had to try our best to peel off four pom poms! The kindergarten classes had to dress like 100-year-olds. Nixon's personality is wild, crazy, and fun, but he does not get behind dress up days usually. Right before Christmas they got to have a pajama day. Nixon refused. He thought it was the weirdest thing ever to wear pj's to school. All that to say, he acted like it was crazy to dress up like an old man until late the night before. Needless to say, we SCRAMBLED and came up with this bow tie and vest. I must say the little comb over hairdo was my favorite. Saturday morning at Nixon and Smith's basketball game I looked over to see this. Saturday night we had DATE NIGHT with some friends. We headed to Mexican Sugar at the Shops of Legacy in Plano. Super fun night! I'll give you lots of details next year. Just in case you have a daughter obsessed like I do. :) A big thanks to M, who made all her Shopkins' dreams come true! I'm including this because I thought it was hysterical. Apparently, even when you're in your 30's-80's there are still shenanigans in the girls' locker room. This was in the women's locker room at our gym. Why oh why?! I'll never know. Thank you for all the love about the updated dining room. I must also give a big shout out to Marla again! She's my second set of eyes and is SO good. She always has the best ideas and lets me know (in such a friendly way) when I'm talking crazy. I couldn't have done it without her! Lots of you asked about the wall color. It's Granite Peak from Sherwin Williams. And these two...are a big ball of crazy! AND...I completely forgot about my $25 Starbucks' Giveaway!! The winner is HANNAH HARDY!! Hannah, I'm e-mailing you today! Oh gosh!! So many cute pictures today!! Love it all!! And, how amazing is Marla and EL's shopkin box!!! Wow!!! Marla has got skills!! That Shopkins lipstick is AMAZING! I'm sooo thankful that Carter's class doesn't do this. You know what his "box" is? A small bag with polka dots. BAM! Ebby Lee's box is amazing!! Marla did such a good job on it! Speaking of which...her craft room is like unreal! She would be so disappointed in my craft drawer...it's scissors and Scotch tape. 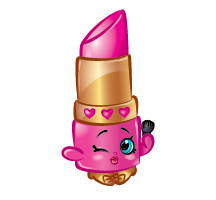 Ebby Lee's Shopkins lipstick is SO CUTE!! And Nixon as a 100-year-old: PRECIOUS! That comb over is adorable, I'm so glad he decided to dress up! That Valentine's box?!?! WOW! Also, my son is the same way on dress up days - he just does not get into it, but Nixon looks smashing!! I think I need a Marla in my life!!! Ebby Lee's box is amazing!!!! And so is your dining room!! I need to borrow Marla for like 15 minutes, just to tell me what direction to go in my blank, slate dining room!! Seriously, that craft room/work room is unbelievable! I reorganize my craft closet once a year, but it never lasts! Thanks to all the gift bags I shove in there. One time my husband even got so overwhelmed with it, he tried to organize it. Ha! Hope you have a great Valentines weekend! What a fun surprise! So excited I won!! I can always use more Starbucks in my life 😊 Also, I'm so impressed with Ebby Lee's box! That is just too cute. That Valentine's box is awesome! So fun! The bra - hilarious! Have a great weekend! My 2nd son was like Nixon...he didn't even like dressing up for Halloween. I'm so behind on reading blogs this week obviously because I never miss yours and I did not see the room update...headed there now! We had so much fun with y'all!!! I have been thinking about that color in your dining room for media room. I just love it! Your Friday faves hit it out of the park this week! Sooo much to love! You look fantastic in your date night picture! Your blog posts brighten my day!!!! Love your positive attitude and sweet pictures of your kiddos. What a cool valentine's box!! Also I recognize the other blonde in your night out with friends. I used to read her blog!! How funny!!! Amanda?! Where'd you find her?